This article first appeared in the book pages of The Ottawa Citizen…since then many milestones have been celebrated, including the 125th anniversary of Christie’s birth. The year was 1916, and the world was at war. Torquay, a popular resort on the Devon coast in southwest England where Agatha Christie had been born on the 15th of September, 1890, was filled with Belgian refugees, and women of independent means who, like the young Mrs. Christie, were determined to do their bit for the war effort. The town hall in Torquay had been converted to a Red Cross hospital two years earlier, and Agatha Christie was one of its most dedicated volunteers. She spend thousands of hours nursing wounded soldiers and many more writing letters home on their behalf, until a severe bout of influenza forced her to give up her work on the ward. But several months later, with her new husband, Colonel Archibald Christie away at the front and her mother, Clarissa Miller, holding court at Ashfield, the family home, Agatha was ready for a new challenge. So she began to write, tentatively at first, and somewhat in the shadow of her older sister, Madge. Madge had already had a number of short stories published in Vanity Fair, and Agatha, an avid reader since childhood, was determined to follow suit, egged on in part by her older sister, who didn’t think she “could do it.” Detective stories were notoriously difficult to write, Madge had warned her, with their complex puzzles and elaborate plots; even she had had trouble concocting one. But Agatha had two things her sister didn’t have: access to a cornucopia of “poisonous substances,” and a driving ambition to succeed. The hospital dispensary where she now worked had all the tools of the crime novelist’s trade. Vials of arsenic, strychnine, morphine, and belladonna lined the cupboards of the dispensary. All she had to do was learn how to use them. so she studied pharmacy under one of Torquay’s leading apothecaries, a “spooky character” named “Mr. P.” who would show up in one of her later books as the sinister Mr. Zachariah Osborne. But for her first novel she decided to remain on more familiar ground. Her lead characters – a funny little Belgian named Hercule Poirot who was “wonderfully clever, but a bit of a dandy,” and the recently invalided Colonel Hastings, a rather dull but useful “Watson” – were not unlike the people she saw every day on the streets of Torquay, and one of her secondary characters, a young woman named Cynthia Murdoch, even worked in the dispensary at the local Red Cross hospital. The murder weapon would, of course, be strychnine and the setting classic Christie: English country house, complete with dysfunctional family, hangers-on and faithful servants. Everything had been going well – and the stage was set, the clues planted and the murder committed – until part way thought, Agatha Christie developed writer’s block. She confessed her lack of progress to her mother, and the redoubtable Mrs. Miller took charge. The solution, she determined, was for her daughter to go to a hotel on Dartmoor and stay there until she’d finished. With its craggy hills of granite known as tors, and its spectacular views of the Devon countryside, Dartmoor National Park was then, as it is now, a wild and desolate place. Sheep roam the park at will. And tourists who hike through the heather on their way to villages with names like Bovey Tracey and Haytor Vale do so at their own risk. Left as it is in its natural state, Dartmoor provides timelessness and a sense of place full of mystery and wonder – just what a burgeoning novelist might need to fuel her imagination. The haunting beauty of the moors had already proved fertile ground for another writer, Sir Arthur Conan Doyle. He had used Buckfast Abbey, an 800-year-old Benedictine ruin in the middle of Dartmoor National Park, as the inspiration for one of his most famous adventures, The Hound of the Baskervilles, in which Sherlock Holmes solves the mystery of “an evil and luminous demon” roaming the moors by night, and puts an end to the curse of the Baskervilles. In their beautifully presented book In the Footsteps of Agatha Christie, self-avowed anglophiles François Rivière and Jean-Bernard Naudin lovingly recreate “Agatha Christie’s country” with spectacular photographs, old and new, of the moors, Agatha Christie’s childhood, her years in Torquay and her later years along the River Dart. Originally published in French in 1995, the book was released in English two years later turning the Moorland Hotel into a mecca for Christie fans. So little had changed since Christie’s 1916 visit, I half-expected to see Poirot and Hastings walking through the gardens to join me on the flagstone terrace for tea and a generous dollop of Devon Cream. A fire in 1970 had destroyed the hotel’s records so it’s impossible to say which room was Dame Agatha’s, but when I was there in 1997, her portrait still hung in the Agatha Christie Lounge presiding over pre-dinner drinks and lending an air of authority to the proceedings. The hotel has since changed hands and now operates as a popular destination for outdoor holidays, but the legacy of its most famous visitor lives on. Despite her success, Christie’s was not a charmed life. Her husband Archibald, like many servicemen, had trouble readjusting after the war. He took a job with the air ministry and the young couple moved to London where Dame Agatha continued to write and had her first and only child, Rosalind. After Archie signed on with a friend of his to tour the world as his financial adviser for an upcoming London exposition, an invitation was extended to his wife to travel with them. Never one to turn down an adventure, Dame Agatha readily agreed. The Christies had an incredible trip, visiting South Africa, Australia, New Zealand and Hawaii, where they learned to surf and stayed in a romantic little bungalow amidst the banana trees. Once back in England, however, Archie’s lassitude returned, and an age-old scenario began to play itself out. He’d taken up golf, a game that held little appeal for his wife – although it had served as a backdrop for her 1923 mystery Murder on the Links. She did go to the club occasionally with her best friend Nan, whose husband was also a member, but most of the time Dame Agatha was in another world, busy planning her next novel or trying to solve a particularly thorny plot problem in the current one. Her mother was ill, she had a young daughter to care for, and Ashfield, her childhood home, was in a state of total disrepair. Archie, meanwhile, had met another woman. Nancy Neele shared his passion for golf, and they became lovers. When, several months later, Archie finally broke the news to his wife, she up and disappeared. Her car was found the next day, abandoned in a chalk-pit on the Surrey Downs. Several hundred police and countless volunteers scoured the countryside. Ten days later, Agatha Christie was discovered in a hotel in northern England, registered under the name of Mrs. Neele. When pressed, she claimed to have had amnesia. Despite Fleet Street’s unceasing speculation, Dame Agatha never publicly explained her disappearance. Robert Barnard, author of a biography entitled A Talent to Deceive, wrote, ‘This refusal to give herself away publicly…is one of her great strengths as a writer…Each of her characters is surveyed, analyzed, dissected as murderer-potential, without an ounce of involvement,” except for maybe Hercule Poirot who might perhaps arouse a “flicker of irritation” in his creator. Along the way, Agatha Christie also wrote six romances under the pseudonym Mary Westmacott in the style of a favourite author of her youth, May Sinclair. Despite the many plays and screen adaptations of Christie’s work, including Witness for the Prosecution and Murder on the Orient Express, one of her biggest coups was a play she wrote in 1952. The Mousetrap has since become the world’s longest-running stage play, and the source of endless royalties, all of which she left to her grandson, Matthew. Whether you’re looking for mystery or an opportunity to explore Christie’s natural habitat, travelling through Devon with In the Footsteps of Agatha Christie as reference will take you from her museum in Torquay across the moors to Haytor and the Moorland Hotel, and then on to the River Dart where Dame Agatha spent a large part of her life with her second husband, archeologist Max Mallowan. They’d met in 1928 on an excavation site in Baghdad and married two years later. For the rest of their married lives, they would divide their time between London, the Middle East and Devon. While her husband wrote archeological tomes, his wife continued her crime writing, rarely granting interviews and steadfastly guarding her family’s privacy, particularly when they stayed at Greenway House, the home she’d purchased overlooking the Dart in 1938. In all, Agatha Christie wrote 15 novels set in, or around, Devon County. 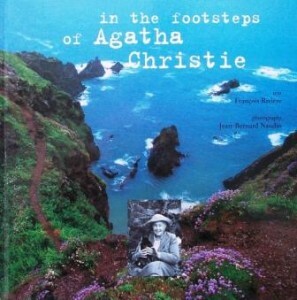 And while innumerable books analyze her work, In the Footsteps of Agatha Christie clearly celebrates her years in Devon. The last third of the book is a village-by-village tour of her most famous haunts, complete with recommended walking tours, travel directions and even suggestions for where to get a good pub lunch. So if what you’re after is a sense of what helped create Agatha Christie’s life as a crime writer, this is the year to visit Devon. But be warned: by the time you finish, you’ll want to download, or dust off, your favourite Agatha Christie. Or search out David Suchet’s art deco interpretation of the classic Christie detective, Hercule Poirot, who was brought to life on Dartmoor and raised on Devon Cream.